Chris Evans is a former newspaper reporter, returned Peace Corps volunteer and fiction writer. 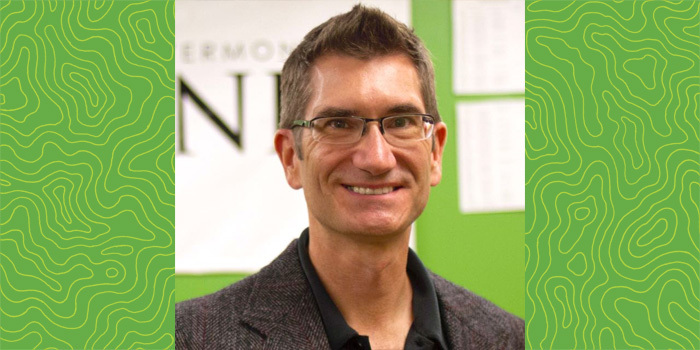 At UVM, he advises The Vermont Cynic, WRUV-FM, and UVMtv in addition to teaching courses in college media, news-writing, and communication law. UVM's theView article "Man in the Middle"
“Out West.” Vantage Point. Burlington, Vermont. Spring 2011. “Candidate Clinton Visits the Bronx.” Apalachee Review. Tallahassee, Florida. Summer 2004. “Cheated.” Washington Square. New York, New York. Summer 2004. “Colic.” The Florida Review. Orlando, Florida. Spring 2004. “Alpha Female.” Thought Magazine. Burlingame, California. 2003. “Amnio.” Soundings East. Salem, Massachusetts. 2003. “New Family Life.” Confluence. Belpre, Ohio. 2003. “How Do You Teach Writing?” National College Newspaper Convention: Associated Collegiate Press. Los Angeles, 2015. “Social Justice Journalism.” National College Media Convention: College Media Association, Associated Collegiate Press. Philadelphia, 2014. “Adviser Training: What You Need to Know About the ‘Money Side.’” National College Media Convention: College Media Association, Associated Collegiate Press. Philadelphia, 2014. “Adviser Training: How to Motivate Students.” National College Media Convention: College Media Association, Associated Collegiate Press. Philadelphia, 2014. “How Do You Teach Writing?” National College Media Convention: College Media Association, Associated Collegiate Press. Philadelphia, 2014. “Adviser Training: Managing Students and Money.” National College Media Convention: College Media Association. New York City, 2014. “Adviser Training: An Introduction to Advising.” National College Media Convention: College Media Association. New York City, 2014. “How Do You Teach Writing?” National College Media Convention: College Media Association. New York City, 2014. Distinguished Multimedia Adviser Award. College Media Association, 2014. Montana Prize in Fiction (Finalist). Cutbank Literary Magazine. 2014. Top 100 Key Ethics and Media Law Resources for Journalists. The University of Vermont Journalism and Media Blog: UVMmedia.net. JournalismDegree.com. 2014. The 100 Best Sites for Journalists. The University of Vermont Journalism and Media Blog: UVMmedia.net. JournalismDegree.com. 2012. The 40 Best Blogs for Student Journalists. The University of Vermont Journalism and Media Blog: UVMmedia.net. The Open Education Database. 2012. The College Media Association Board of Directors Award. National award for excellence in college media advising and advocacy. 2011. The Kroepsch-Maurice Excellence in Teaching Award (Finalist). University of Vermont. 2011. Very Short Fiction Award (Finalist). Glimmer Train. 2010. Student Choice Award for Excellence in Teaching. Valencia Community College. 2006. Program Director’sAward for Teaching Excellence. New York University Expository Writing Program. 2002, 2003, 2004. Very Short Fiction Award (Finalist). Glimmer Train. 2002. Best Education Reporting. School Bell Award: Florida Education Association. 1996. Best Single Newspaper Section. National Award: Education Writers Association. 1995. Benjamin Fine Award for Outstanding Education Reporting. National Association of Secondary School Principals. 1995.
college media, news-writing, and communication law.